Is that you have to sail downwind. And this is rarely truer than when it is windy, it is the first sail of the season for most of the group AND you have taken them a bit further that you intended. It all started so well, eight Fusions, three Lasers and even a second instructor (Thanks Brian, it was good to have you along). We had a strict timetable for a change, I had to be back ashore by 11 as I had a meeting at 12 with our Insurance people. The decision was taken that there would be no racing – resulting in Liz going back inside to put more clothes on - and that we would go for just a general sail. To reef or not to reef? Well, if you ask yourself that question then the answer has got to be to reef. Then the question is one or two? Well that’s a trick question really as in a boat like a Fusion (Pico, Topper) then never less than two. So off we set into a 15+ knot breeze on port tack, gathering all boats together before a tack onto starboard tack and heading out towards Brownsea Island. We then gather again, tack onto port and head towards Poole Quay, then gather, tack and off to Corfe Castle. So far we have been an hour, sailing upwind in windy conditions, a lot of hiking and strangely not a lot of talking amongst the sailors. And we have covered about four miles. Plenty of time though, as it won’t take long to sail back downwind, so “let’s keep going”. Three small innocent words that would come back to haunt me. One more tack to take us even further from home, then gather, rest and run for home. Well when I say “run”, the last thing that you want to do in windy conditions is to go on a dead run, in tippy boats and wind against tide which creates a few more waves for you to surf down/capsize on. So we go for a broad reach towards Brownsea and when we get there no-one is really up for gybing so we tack round. The problem with that is a tack takes you back upwind where you have just come from before you can bear away again to head downwind. A bit like two steps forward, one back. I had envisaged the sail back taking 15 minutes, landing us on shore at about 11.10 giving me plenty of time to get to my meeting. 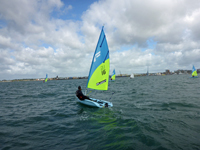 But sailors were getting tired, the tide was against us, we weren’t going as far downwind as I hoped and we had the odd capsize. Still not a lot of talking though. Some heavy breathing yes, but not a lot of talking. We also still had to get the boats through the marina gap on a dead run before landing on a lee shore. 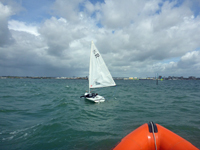 Nigel, the gentleman who started the whole Ladies sailing at Parkstone kindly called me on the VHF. It seems he could watch what was going on from his garden. “Is there anything wrong with the boat or lady being towed in Peter?” “Apart from being a tad tired, nothing” I replied. So to get all the boats in safely we undid all the mainsheets to allow the boom to swing round the front of the boat and just carefully drift in. Just enough time for me to be dropped ashore by my driver Angie, for me to rush up to the ladies to apologise profusely to them all for working them so hard before I jump into my car at 11.57, still kitted out in waterproofs and buoyancy aid to drive to the other side of Poole for my midday meeting. So I missed out on the chat and coffee afterwards which I understand gave the ladies an opportunity to vent their feelings about me but I gather that next week they are all going to be bringing whistles and there will be lots of references about Corfe Castle. ? Rockley Owner Peter Gordon takes time out to teach the 2018 Leap for Success candidates as they take on the RYA Dinghy Instructor Course. 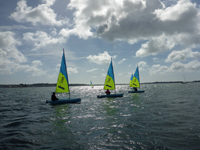 The ladies of the Parkstone Yacht Club sailing session were greeted with a very glassy Poole Harbour and the enthusiasm to race, let alone go out, was low.